Gothic art was a Medieval art movement that lasted about 200 years. It began in France in Île-de-France at the Abbey Church of St Denis built by Abbot Suger, out of the Romanesque period in the mid-12th century, concurrent with Gothic architecture found in Cathedrals. By the late 14th century, it had evolved towards a more secular and natural style known as International Gothic, which continued until the late 15th century, where it evolved into Renaissance art. It spread to all of Western Europe, and much of Southern and Central Europe, never quite effacing more classical styles in Italy. In the late 14th century, the sophisticated court style of International Gothic developed, which continued to evolve until the late 15th century. In many areas, especially Germany, Late Gothic art continued well into the 16th century, before being subsumed into Renaissance art. Primary media in the Gothic period included sculpture, panel painting, stained glass, fresco and illuminated manuscripts. The easily recognizable shifts in architecture from Romanesque to Gothic, and Gothic to Renaissance styles, are typically used to define the periods in art in all media, although in many ways figurative art developed at a different pace. Originating in 12th century France and lasting into the 16th century, Gothic architecture was known during the period as "Frankish work" (Opus Francigenum), with the term Gothic first appearing during the latter part of the Renaissance. Its characteristic features include the pointed arch, the ribbed vault and the flying buttress. 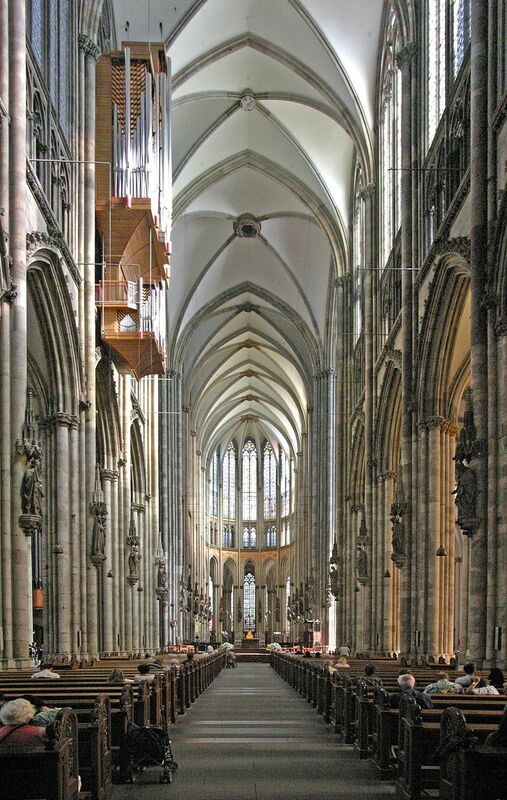 A strong example of clear Gothic architecture is the High Cathedral of St. Peter, a Roman Catholic church in Cologne, Germany. It is the seat of the Archbishop of Cologne and the administration of the Archdiocese of Cologne. It is a renowned monument of German Catholicism and Gothic architecture and is a World Heritage Site. It is Germany's most visited landmark, attracting an average of 20,000 people a day. Construction of Cologne Cathedral commenced in 1248 and was halted in 1473, leaving it unfinished. Work restarted in the 19th century and was completed, to the original plan, in 1880. It is 144.5 metres (474 ft) long, 86.5 m (284 ft) wide and its towers are approximately 157 m (515 ft) tall. The cathedral is the largest Gothic church in Northern Europe and has the second-tallest spires and largest facade of any church in the world.